Microsoft Silverlight plugin is no longer supported by Chrome browser after version 42.0. When you open a webpage which uses Silverlight, Plug-in not supported error is shown and content doesn't loads. The browser asks you to update the plugin, but even after updating, you see the same message. Microsoft Silverlight is a deprecated application framework for writing and running rich Internet applications, similar to Adobe Flash. A plug-in for Silverlight is available for some browsers, but not for Chrome due to Silverlight's use of the old and insecure NPAPI framework. Restart the browser. Now try to access the page. It should work. 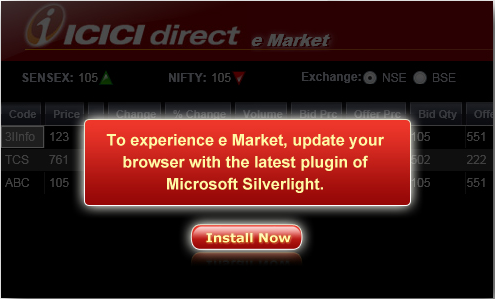 One of my friend told he is unable to load eMarketwatch portal provided by icicidirect.com. The above fix holds good for this.